As this Adventure Holiday departs at 7.00am, accommodation will need to be pre-booked for the previous night. Welcome to the Red Centre! 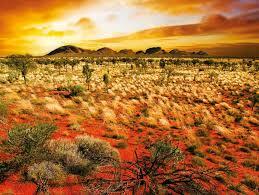 This morning travel across vast cattle properties and red desert sands on a journey through the Outback to Ayers Rock. 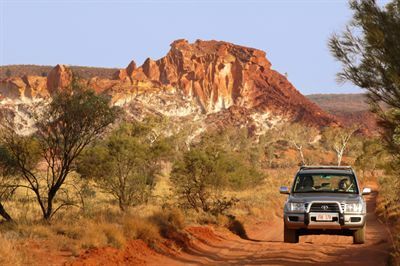 This afternoon travel in to World Heritage listed Uluru - Kata Tjuta National Park for a drive around Uluru while your Driver Guide imparts their incredible knowledge, giving you a greater understanding of the natural and cultural significance of the region. Later you’ll take a guided walk to Mutitjulu Waterhole and view ancient rock art along the way. Continue to Uluru - Kata Tjuta Cultural Centre to see Aboriginal arts and crafts before heading to the Uluru sunset viewing area. Relax with a glass of sparkling wine and nibbles as you watch the rock change colour as the sun sets below the western horizon. It’s a spectacular sight you’ll never forget. Rise early and travel to the Uluru sunrise viewing area, Talinguru Nyakunytjaku to see the morning’s first rays of sun set the Red Centre alight while you enjoy a warming cup of tea, coffee or hot chocolate. After sunrise travel to the mystical domes of Kata TJUTA: Tjuta. On the way stop to enjoy spectacular panoramic views over southern side of the formations before continuing to Walpa Gorge to take a walk following the natural creek bed between two of the largest domes. The rocky, but gentle track is a 2.6 kilometre return track that allows you to get right between the sheer red rugged walls. Take a minute to pause and absorb the mesmerising scenery that surrounds you. In the afternoon travel to Kings Canyon Resort for your overnight stay. On the way, marvel at Atila (Mt. Conner), the ‘forgotten wonder of Central Australia’. Keep a look out for wildlife including camels, kangaroos, brumbies and dingoes. Travel to Kings Canyon bright and early to hike to the top of the Kings Canyon rim. The six kilometre Rim Walk is a once in a lifetime experience. Climb up a 100 metre cliff face and marvel at impressive views of sandstone walls, grottos, chasms and cliffs and the Garden of Eden. Here is a natural spring waterhole surrounded by local and exotic plants. The walk will take up to three hours and is advisable for people with a good level of fitness. You may prefer to explore the boulder-strewn creek bed, an easier shady walk following the trail between the two sheer walls of the canyon. After your walk, travel back to Kings Canyon Resort where you can treat yourself to lunch (own expense) before enjoying the amazing outback scenery as you head back to Alice Springs. As this Adventure Holiday concludes after 7.00pm, accommodation will need to be pre-booked for tonight. Moderate level of fitness required. Good level of fitness require for the three hour walk around Kings Canyon rim. Or low to moderate level of fitness required for the canyon floor walk. On this Adventure Holiday you may travel in a large coach, with a different Driver Guide each day, so you’ll benefit from their combined knowledge and experience. Plus you’ll meet a different group of like-minded travellers each day.